Some have argued that higher corporate taxes could be a source of additional revenue to meet future fiscal commitments, but higher corporate taxes would hamper investment, job creation and growth. As it is, Canada has an internationally competitive corporate tax regime. 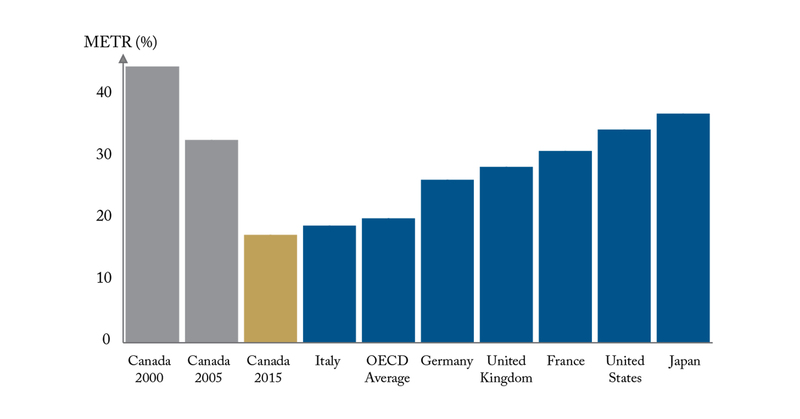 As the above graph shows, Canada’s total tax burden on new investments for existing firms (including everything from federal and provincial corporate tax rates to the impact of various business allowances, deductions, credits, capital and input taxes) has decreased to 18 percent in 2015 from 45 percent in 2000 and 33 percent in 2005. At 18 percent, it is lower level than any other G-7 countries and the OECD average.